Did Guardrail Flaw Contribute To Injuries In San Marcos Accident? A driver near Cal State San Marcos may lose his legs after the compartment of his car was impaled by a guardrail on Twin Oaks Valley Road in San Marcos. The guardrail was made by Trinity Industries, who has come under fire recently after it was fined $663 million for defrauding the US Government. In that case, a competitor Trinity sued in 2012 alleging that it failed to notify the Federal Administration before it made a design change in 2005. The design change was small, but it has been alleged made the guardrails less safe. Last Monday morning in San Marcos, a man lost control of his car, hitting a fire hydrant, and then driving right into the end of the guardrail. 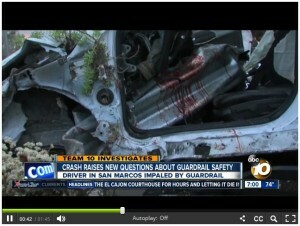 As the dramatic News10 video shoes, the guardrail pierced the compartment, slicing through the driver’s legs. In an interesting twist, News10 contacted the City of San Marcos, which stated that the guardrails were not Trinity rails, despite an allegation that there were Trinity markings on the rails. The city apparently changed its position, and later said the rail was standard Trinity guardrail. Since the fine was levied against Trinity just last month, there have been at least 14 lawsuits filed against Trinity for injuries related to the guardrails, including five deaths. The initial cause of the San Marcos accident has not been determined, but it is believed that alcohol may have played a role. Walton Law Firm is a personal injury law firm based in San Marcos, California. Mr. Walton represents individuals in a wide variety of personal injury and wrongful death matters, including cases product liability. All consultations are free and confidential. (760) 571-5500.